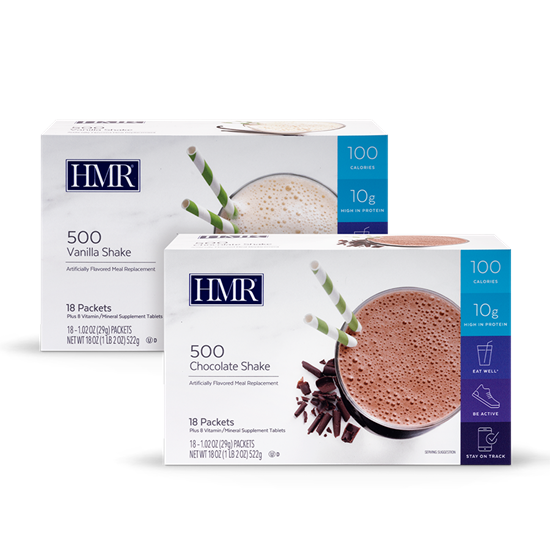 With only 100 calories in each low-fat shake, you’re able to enjoy rich, satisfying “meals” while losing weight. Available in chocolate or vanilla, each box of HMR® 500 Shake mix also includes multivitamin/mineral tablets. One box contains 18 convenient, single-serving packets. 100 calories 10g protein 300mg calcium 0g fat 0g trans fat 17g carbohydrate 180mg sodium. 100 calories 10g protein 300mg calcium 0.5g fat 0g trans fat 16g carbohydrate 190mg sodium.